The Golden Gate Bridge in San Francisco has numerous claims to fame. Once the longest suspension bridge in the world, and still probably the most iconic, it’s a central feature of the SF Bay Area — my own home. Less admirable is the fact that it remains among the most popular bridges in the nation for suicidal people to jump from. In fact, it’s one of the most “utilized” suicide spots in the entire world, with over 1,600 jumps made so far, most of them fatal. (Exact numbers are hard to come by for a good reason: bridge administrators and media outlets stopped keeping an official tally when they realized it was incentivizing people to ring in big milestones with their own attempts — lucky number 1,000 and so forth.) Someone still tries to jump about once every two weeks, which sounds insane, but is true. 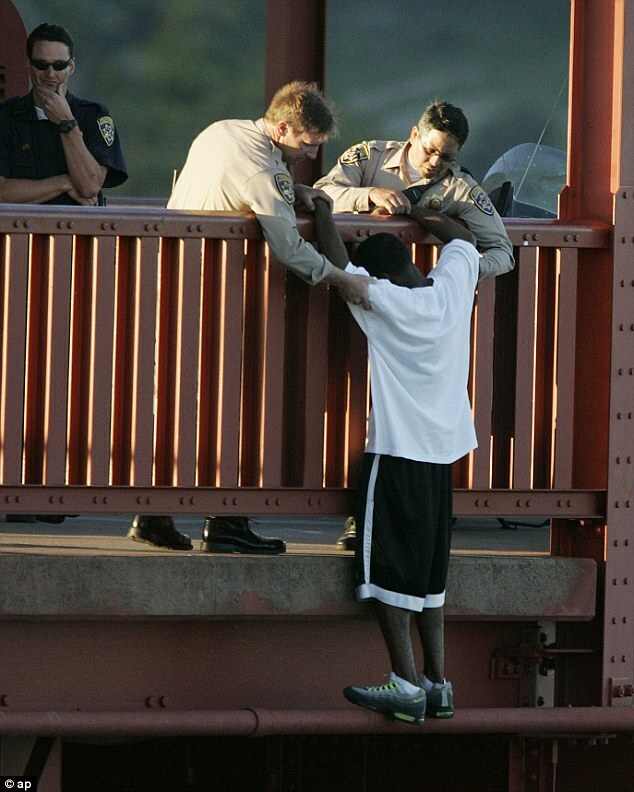 Sergeant Kevin Briggs was a California Highway Patrol officer who spent a large part of his career patrolling that same bridge, which led to an interesting twist on his job description: suicide prevention. See, often times he was the one to notice a pedestrian who looked like they were considering jumping, or were even in the process of climbing over the rail. Sometimes he’d be called in by others who saw it first. Jumpers tended to stand on the “chord,” a ledge of piping just beyond the safety rail and the last solid ground before open air. Kevin would talk to them there, and try to convince them it was a bad idea. It wasn’t something he had any training to do, at least not at first, or experience with, although he picked that up quickly. He had suicide in his family — as many of us do, since it’s incredibly common — but otherwise, he fell into the role the way many of us fall into our callings. Eventually, he made it his niche, leading a trained team of interveners. Over the years, he spoke to hundreds of jumpers. At first, he’d approach benignly — “How are you feeling today?” and “What’s your plan for tomorrow?” For those without plans, he’d help them make some, because people with a plan tended to stick around to fulfill it. Either way, the encounters tended to unfold similarly. And as a rule, they went well. Of the countless desperate people he met, only two ended up jumping once he’d managed to make contact. The jumpers met the pattern recognized by psychiatry as comprising the depressed and suicidal. They exhibited hopelessness — the outlook that things are terrible and will never get better. Most of us can ride out terrible storms, but if there’s no prospect of the storm ever ending, why bother? (“What do you do,” asked one, “when hope isn’t there?”) Then helplessness — the belief that there’s no remedy, solution, decision, medicine, or lifeline that can make a difference. People withdraw socially and lose interest in things they once enjoyed. They retreat from the world. They show up at the bridge because there’s no reason to be anywhere different. Inexplicably, we in EMS seem to have developed the belief that most suicidal patients are “crazy” — as in psychotic — or dangerous — as in homicidal. As a rule, neither is true. These people aren’t out to hurt anybody. (One of the “ones who got away” politely shook Briggs’s hand and apologized before jumping.) They just want to escape the pain. With alcohol, with drugs, with sleep, with death. How did Kevin Briggs have so much success? It’s a question that gets more perplexing the more you consider it. By definition, these are people who have lost all hope, exhausted all options, discarded alternatives until they’re ready to embrace the most permanent solution possible. And yet, a total stranger was able to approach them at their final moments and convince them to see things differently. How? Through no secret system. He didn’t argue, cajole, or debate them. Nor did he tell anybody he knew how they felt or blame them for their actions. Mostly he listened to understand. Used their name to keep them anchored to reality. Occasionally, he’d share personal stories, things nobody else knew, as if bestowing them upon someone made them responsible for his secrets. In the end, merely being there seemed to make the difference. Many interventions were successful within 10 minutes. Some lasted many hours. The longer the conversation went on, the better his odds, Briggs would say. The human connection grew stronger and stronger. People ready to jump away from nothing would reconsider, because now they were leaving something behind. It’s impolite to leave a conversation. It’s wrong to fail when someone cares about your success. Kevin had made it clear that he cared if they died, and they didn’t want to let Kevin down. The most important secret of all is that this medicine wasn’t temporary. Another common truism in EMS is that preventing suicide is a Sisyphean task, because if someone wants to take their life, eventually they’ll succeed no matter how many times we slap the gun from their hand. Surely if they don’t jump here, they’ll just jump from the next bridge instead. But that’s not what the facts show. 94% of the ones who reconsidered jumping never tried again, instead living out long and fruitful lives. And the ones who jumped and survived nearly all described the same thought: the moment they stepped from the bridge, they regretted what they’d done. Despite what they’d thought, they didn’t really want to die. “I instantly realized that everything in my life that I’d thought was unfixable was totally fixable — except for having just jumped,” reported one. Much like reperfusing the STEMI, stabilizing the CHF exacerbation, or patching up the gunshot wound, this business was one of pulling people back from a preventable brink — people with the real potential to eventually leave it behind them. As one mother wrote Briggs: “Thanks so much for standing up for those who may be only temporarily too weak to stand for themselves.” That sounds like our job, doesn’t it? Sgt. Kevin Briggs recently retired from the CHP to continue pursuing suicide activism. And last year, work was finally approved on an anti-jumping safety net to be built beneath the Golden Gate Bridge. Maybe soon his brand of heroism won’t be necessary there. But it’ll be needed somewhere. Others are doing their part. Shouldn’t we do ours? I think of my mouth running in the past, prompted by articles such as this. To those people who we have met in your homes and taken in our ambulances in times of your crisis: I am sorry. I wish I could have met you with humility and done more for you when I could have. When one is still attached to the community, it’s easy to get away with a garbage attitude, but it does not fly when one is fishing for men. Sergeant Kevin Briggs must be commended for his selfless dedication to saving lives. Instead of saving just one life in the process, he managed to save many lives, all related to that person as father, mother, brothers, sisters, sons, daughters, relatives, and friends. Imagine their pain when they find their near and dear one has committed suicide and will not be with them anymore. This pain will also remain with them for years to come. Today, we surely need men like Briggs, who managed to fill happiness in the life of others and stood up for those who may be only temporarily too weak to stand for themselves. My greatest pleasure in life will be meeting and talking to Sgt. Kevin Briggs for his accomplishments. We can imagine the smile and happiness he has brought in the life of so many families with his selfless acts. It also reminds us that there are still people in this world who are trying to make this world a happier place with their noble deeds.